First Line: "Let's take a break, Evelyn." Josie Blair hasn't had time to worry about the life she had in New York City. Along with owning Miss Marple Knits, she's trying to jumpstart a blog, and she's managed to rent out the space next-door to Lyndon and Harry, who'll be opening an antique shop. But before she can formally welcome her new neighbors, Josie finds Lyndon stabbed to death on the floor of his shop. Police like his partner Harry for the murder, but Josie isn't so sure. Now she's got an investigation on her hands when she'd really rather be repurposing that box of vintage doilies Lyndon gave her or learning how to knit. 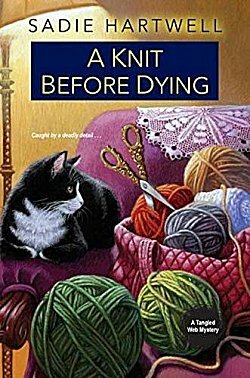 Anyway, there's a solid cast of secondary characters in A Knit Before Dying, and several of them have become Josie's good friends. For comic relief, there are two cantankerous, mule-headed old men in town-- one of them Josie's Uncle Eb-- who have been feuding with each other practically since they were in diapers. Now we get some background on the feud, and although the start to the feud is much as I'd guessed, it still made me scratch my head. Some of the things those two get up to do make for good comic relief, however! There's also a complex mystery to enjoy, so if you're in the mood for good characters, crafting, a bit of humor, and a murder to solve, curl up with Sadie Hartwell's Tangled Web series. The first one is Yarned and Dangerous. I like that title, Cathy. It's quite clever, and the name of Josie Blair's shop is inspired! Love it! And glad you're enjoying the series. And while we're at it... the covers are really good, too!